The first event was the Global Gift Nelson Mandela Centenary Dinner Initiative, which took place on the 24thApril bringing together Global Gift and South African communities at the Rosewood London hotel to pay tribute to the South African politician and philanthropist. Among the lots auctioned in Paris, the pictorial jewel NYC girls donated by the Spanish painter and dancer Pepe Muñoz was highlighted. The Global Gift Foundation turned London and Paris into the capitals of philanthropy with the celebration of two charity events in which Maria Bravo and Vanessa Williams were Chairs of the event. In less than 24 hours, these cities brought together the most philanthropic celebrities to raise funds for social projects linked to beneficiary foundations. The first appointment was The Global Gift Nelson Mandela Centenary Dinner, an initiative of the Global Gift and Nelson Mandela Foundations to pay tribute to the South African philanthropist and politician and celebrate the beginning of a strong alliance between these two foundations and walk together in favour of human rights. The following morning, María Bravo and her team travelled to the French capital to celebrate The Global Gift Gala Paris for the eighth consecutive year. A gala that is gaining importance internationally and that the Parisian press has long called the gala of the year. In this edition, María Bravo awarded the Global Gift Award to Emma Bunton in recognition of the incredible humanitarian work that the English singer began two decades ago to protect children in vulnerable situations. The evening of April 24th 2018 will be remembered in London as a magical evening that brought together personalities from around the world to pay tribute to Nelson Mandela in what would have been the year of his hundredth birthday. The fight for causes such as freedom, equality and social justice are some of the values ​​that the Nelson Mandela and Global Gift foundations have in common and were decisive when it comes to joining forces to celebrate The Global Gift Nelson Mandela Centenary Dinner. 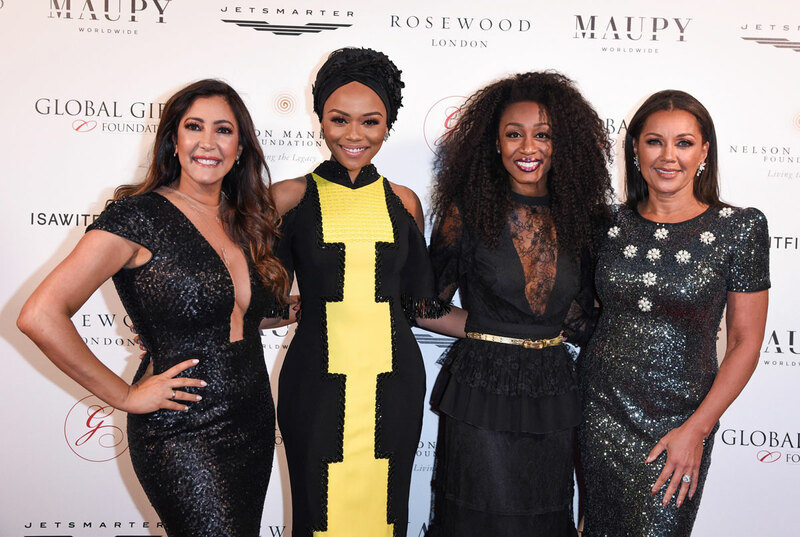 The gala, which was presented by the well-known South African television presenter Bonang Matheba, took place in The Mirror Room of Rosewood London, one of the most impressive places in London to enjoy excellent culinary experiences. The welcome cocktail was held at the Scarfes Bar, named after the famous British artist and caricaturist Gerald Scarfe, whose work adorns the walls of this sophisticated space with a private club atmosphere. Famous personalities graced the red carpet such as singers Sinitta and Beverley Knight, actor Craig McGinlay, television star Georgia Toffolo, Shelby Tribble, Natasha Grain and Nicole Bass, among others. In addition to the musical performances, the evening was enlivened by a live charity where the funds raised will go to a South African orphanage and the Global Gift House. The first Global Gift Nelson Mandela initiative was supported by the women’s fashion firm I Saw It First, luxury car company USHER, Rosewood London and private jet company JetSmarter. The VIII Global Gift Gala in Paris Recognizes Emma Bunton´s Philanthropic work. Paris once again shone with the celebration of the VIII Global Gift Gala. The French capital gathered great celebrities on the night of April 25thin a gala that is increasingly relevant in the world of philanthropy. The protagonist of the evening was Emma Bunton, who received the Global Gift Philanthropist Award. Known for being one of the components of the successful female music group Spice Girls, Emma Bunton’s relationship with charity campaigns dates back to 1999. In that year, the singer joined a Nordoff-Robbins camaign, focused on providing therapies for children with psychological, physical or developmental disabilities. She has also collaborated on several occasions with UNICEF to raise money and finance vaccines for children, carrying out humanitarian aid work in Africa to eradicate maternal and neonatal tetanus. Since 2015, bullying has been the main cause that Bunton has fought in actions like Kidscape or BeatBullying to help children at risk. On previous occasions, this award has been given to personalities such as Laetitia Casta, Pamela Anderson, Mariah Carey or football coach Vicente del Bosque. The emblematic Four Seasons Hotel George V welcomed another edition – as Maria Bravo mentioned in her speech: “I am very happy for the great reception that the VIII Global Gift Gala Paris has had in this wonderful and supportive city. It’s been eight years that unite us in which Paris has shown us that it is a key place from which we can help thousands of people. I also want to thank the support of this magnificent hotel that with so much affection welcomes us year after year, our Honorary Chair Vanessa Williams and UNICEF France for their encouragement and enthusiasm to continue working in joint causes. On this special night our example to follow is Emma Bunton, whom I congratulate for her great work and who we are honoured to give the Global Gift Philanthropist Award. ” Emma Bunton, in addition to thanking and being proud of the award received, emphasized her work as a mother, a role she assured that makes her learn something new every day. Vanessa Williams thanked María Bravo for thinking of her as a Global Gift Ambassador and said that “helping is a peaceful feeling and that they will continue to do much more together”. One of the most emotional moments of the evening was when María Bravo got up from her chair to encourage the guests to be generous with their direct donations. María Bravo asked everyone who wanted to collaborate to stand up and take to the stage with her. Within 15 minutes there were more people on the stage than in the table area. Another of the most acclaimed protagonists of the night was Miss France 2018, Maeva Coucke, along with the actresses Fabienne Carat and Elisa Bachir Bey. The actor Gary Dourdan, known for his role in the series CSI, and Anthony Delon also attende, as did Spanish dancer and painter, Pepe Muñoz, who donated his piece NYC Girls for the auction. The dinner was led by the three-Michelin-star chef Christian Le Squer, responsible for the gastronomic on offer at the Four Seasons George V hotel, creating a special avant-garde menu for the occasion. María Bravo, CEO of the Global Gift Foundation announced that the funds raised will go to different projects promoted by UNICEF France, as well as making a donation to Fredonia College Foundation, the charity chosen by the Honorary Chair Vanessa Williams. Specifically, UNICEF France chose its international children’s project to ensure basic education for children in the Togo region. The organization, established in more than 190 countries, is based on the International Convention on Children Rights (CRC) to achieve protection, education and health for children around the world. “We work so that all the children of the world can enjoy their childhood and for this we need them to grow up healthy, so that they can study to improve their future and that none suffer from any type of abuse or exploitation,” stated UNICEF France President, Jean Marie Dru. The VIII Global Gift Gala in Paris was also sponsored by event and marketing agency MAUPY WORLDWIDE, Four Seasons George V, Webedia, private jets company JetSmarter and Playa Padre. May is another key month in the Global Gift Foundation calendar. The night of the 10th will celebrate the famous Global Gift Initiative Cannes, which every year returns to the iconic stage of the Cannes Film Festival at Mouton Cadet and this year has the support of GAURA as Official Sponsor. GAURA is a company specializing in hydrogen water dispensers for domestic use that, in addition to developing products with positive effects for the treatment of eczema, diabetes and other diseases, is firmly committed to improving the quality of life of the most disadvantaged through of the donation of a part of its profits. A business philosophy that they want to share to multiply aid and make this world a better place. “We are truly grateful to support the Global Gift Foundation. We feel a great respect for the complete dedication and the tireless efforts that are made to improve the quality of life of children, women and the disabled. We are pleased to be part of this wonderful action, spreading love to those who need it most, “said the brand’s representative. The next initiative of the Maria Bravo Foundation will feature an exceptional guest, actor Luke Evans. “Cannes is a very special place for the Global Gift Foundation, because it is here we celebrate our most exclusive event. We are surrounded by personalities from the movie mecca and for us it is a great opportunity to let them know about the multiple solidarity projects we are working on, “said María Bravo.